Zinnas are popular garden annual or perennial plants that originated in Mexico. Zinnia elegans was sent from Mexico to Madrid, Spain by Casimir Gomez de Ortego to his friend the marchioness of Bute. Zinnia is named after Johann Gottfried Zinn, who was a medical professor at Gottingen University who is best known for publishing a book on the anatomy of the eye. Author Diana Wells states that the Spaniards in Mexico referred to zinnia as mal de ojos "because the flowers were small and considered ugly to the eye." But I wonder if she doesn't miss something in the translation because some Google searches reveal that mal de ojo is Spanish for the evil eye. Either way, it is interesting that so much history of the zinnia is connected to the eye. When I began to research plants to grow in my garden, that started out as a memorial/mourning garden after my grandfather passed away, I learned that zinnia is said to represent "thinking/in memory of an absent friend" and I decided it would be a staple plant in my garden. The problem I had with zinnias was that I wasn't a fan of any of the colors I saw in planters and gardens all over Chicago. That quickly changed when I discovered Zinnia "Green Envy" and fell in love with the photos of this green flower on websites and seed catalogs. The flowers are usually smaller than other hybrids that are commonly available on seed racks and garden centers but the green flowers make up for that in my opinion. I've read a few threads on gardening forums where gardeners express being dissatisfied with the consistency of the blooms from various seed sources. The ones in my garden came from seeds sold by Martha Stewart, Burpee and Wal-Mart and I haven't noticed much of a difference in the color and shape between these seed sources. One other complaint, if you can call it that, among gardeners on the forums I've visited is that the flowers bloom later in the season which results in bad cases of powdery mildew. My personal experience with this particular zinnia in my garden has been the opposite and even the later blooms I consider to be a bonus because in late October there isn't much blooming in Chicago. Zinnia "Green Envy" was blooming in the garden when the Red Admiral butterflies were visiting a few weeks back. When the gardeners on my block are pulling their zinnias because they're covered with powdery mildew mine haven't been affected yet. I credit this to the fact that as soon as the ground is workable I directly sow my zinnia seeds in the soil in full sun and allow them to get a head start on the growing season. I think I reduce the chances of powdery mildew by making sure I don't get water on the foliage when watering and I don't water late in the day when the water has less time to evaporate. This way I get earlier blooms and I am able to enjoy them in my garden and as cut flowers when other people around me are pulling them from their gardens. Did you know that most of the hybrid zinnias we have today are as a result of a single plant grown in an experimental field by Burpee? In the sixty-sixth row of this field was one plant that looked different than the rest-it has since come to be known as "Old 66." Fascinating! Has zinnias been used in the field of medicine? I had no idea of the history of Zinnias. Thank you for sharing (I did track down Diana Well's book ... it is wonderful). 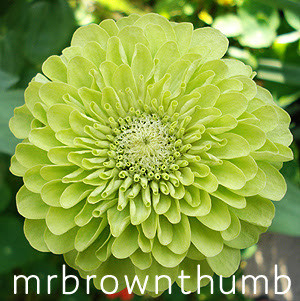 These green Zinnias are pretty ... I think I will consider getting some seeds for next year. There's always next year! You know I wondered about that but I couldn't find anything that indicated they had any medicinal or edible properties. Glad you liked the book and these flowers. If you like the colors I've been reading that there are greener and larger versions available, but I've not seen them in stores. Yum! Given that I like anything with green flowers--I have a slight bit of green envy happening here. I grew these one year but they weren't very big--about the size of a 50 cent piece (loonie here). Are yours bigger than that? I have no zinnias at all, mostly because I didn't get around to planting them--hopefuly the seed will still be good next year! I just went out and measured the flowers-they're 3 inches across. The seeds should still be good this year I planted two year old seeds. Wow - that is a lovely Zinnia! Also appreciated the history/info you shared. I am preparing to do a post on my Cactus Zinnias...a favorite of mine. I just checked your blog and didn't see a post on it. I like the Cactus Zinnias but haven't had good luck with the blooms so make sure to let me know when you post it. I love 'Green Envy' too! I grew it last year and saved the seed. I mixed it in with white, red, and yellow, but only a few germinated this year. I'll have to buy some next year so I can have bunches of them again! Awesome post, and I love all of the zinnia info. I seed them mid summer, so that come now, they're just thinking about starting to bloom. Perfect for later summer gorgeousness in the Pacific Northwest. That's a really interesting story. Any chance you still have the article from the newspaper where your green zinnia was featured?